Halloween season came to an end with candy, rotten pumpkins and rain, but, if you still want to maintain the spooky season, Netflix’s newest release will keep that feeling alive. Sabrina Spellman’s back, but in a much different light that might keep you up at night. On Oct. 26, Netflix premiered its own adaptation of Sabrina the Teenage Witch; The Chilling Adventures of Sabrina. It’s meant to be directly based off of the 2014 comic book series that retells Sabrina’s origin story with a darker more modern take, and that’s exactly what it does. 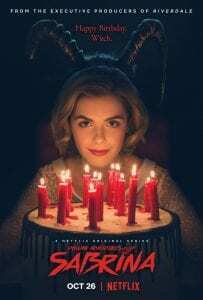 The show debuts Kiernan Shipka as Sabrina, Ross Lynch as Harvey Kinkle, Michelle Gomez as Madam Saten, Chance Perdomo as Ambrose and Lucy Davis and Miranda Otto as Sabrina’s two overbearing aunts, Zelda and Hilda Spellman. Due to the dark and “witchy” themes, I wouldn’t recommend this show for someone younger than 15 or for someone that wants to avoid satanic themes. Even though the show is supposed to be a different take on the world of Greendale, it still delivers the magic of the original series. The show draws you in, making it easy to binge watch within the span of one weekend, but even if you’re not the type of person to watch a show that quickly, it’s still a show that can be easily finished. And if you finish it before December 14, you can catch a special episode that’s dedicated to the Winter Solstice which will be available on Netflix.